World leaders at the G20 summit in London have agreed on a compromise package of $1 trillion in stimulus cash and more market regulation to combat the worst economic crisis since the 1930s. The world's richest countries agreed to triple the finances of the International Monetary Fund and also backed new curbs on financial markets in their meeting in London on Thursday. Gordon Brown, the prime minister of host nation Britain, pledged enhanced supervision for large hedge funds and a crackdown on tax havens in his closing speech at the summit. "The old Washington consensus is over, today we have reached a new consensus that we will do what is necessary to restore growth and jobs and prevent a crisis such as this from happening again," Brown said. "We have... agreed additional resources of $1 trillion that are available to the world economy to the IMF and other institutions." Brown said that the summit's final communique provided for a $500bn boost to the IMF's resources, raising to $750bn the funds it can make available to countries worst hit by the global crisis. The summit was held as about 400 protesters protested near the east London venue, a day after thousands of people staged demonstrations in the centre of the city to speak out against governments' management of the financial crisis. But share markets appeared to welcome the agreement, hoping that it would add to some signs that the global downturn may be beginning to bottom out. The Dow Jones industrial average in the US surging past the 8,000 barrier for the first time since February 9 before closing at 7,978.08 for a gain for 2.8 per cent. 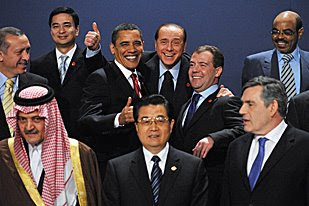 Barack Obama, the US president, said that the G20 members had rejected the protectionism that could have deepened the economic crisis and that the summit had agreed to "unprecedented steps to restore growth" and to prevent future crises. "We are protecting those that don't always have a voice in the G20 but who have suffered greatly in this crisis," he said. "It is also my job to lead America in recognising that its fate is as part of the world, that if we neglect the poorer countries not only will we deprive ourselves ... but that despair may turn to violence that may turn on us." Brown said the G20 would publish a list of tax havens that were non-compliant with current regulations and would bring in "tough sanctions" for those who do not comply with any new changes. "The banking secrecy of the past must come to an end," he said. Nicolas Sarkozy, the French president, said that the conclusions of the summit were "more than we could have hoped for". "The G20 countries have decided on a profound reform of the international financial architecture," he said. "It is now on record that a breakdown in regulation was at the origin of the financial crisis." Angela Merkel, the German chancellor, called the agreement an "almost historic" compromise. There had been indications before the summit that members were divided on how best to pull the global economy out of recession. The US and Britain were in favour of pumping more money into the financial system, seeing the strategy as a way to encourage banks to lend to consumers and thus entice them to spend money on goods and services. The US has so far spent, lent or guaranteed $12.8 trillion - almost as much as the value of everything produced in the country in 2008. But France and Germany had signalled their opposition to further fiscal stimulus packages, calling instead for an emphasis to be placed on increasing regulation of the international financial system. Dominique Strauss-Kahn, the IMF chief, was pleased with the outcome, calling the agreement "the most co-ordinated stimulus ever". "It's a global stimulus we asked for and we have been followed," he said. Samah El-Shahat, Al Jazeera's economic analyst, said that Brown's comments of the Washington consensus were the most remarkable from the summit. "To hear that the Washington consensus, which places all decisions in the hands of the market, is over, is incredible," she said. "The Washington consensus has hurt so many people in developing countries. But what will replace it?" Leaders also agreed at closed meetings on a trade finance package worth $250bn to support global trade flows and agreed to kick start stalled Doha trade liberalisation talks at the next G8 meeting in Italy in July. Another G20 summit will be held in New York in September as world leaders gather for the UN General Assembly. Sarkozy said that meeting would focus on "evaluation" of the measures agreed in London.